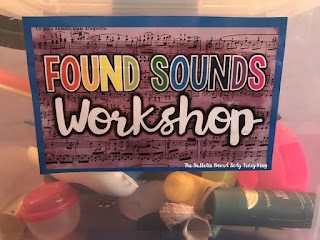 Found Sounds Workshop has always been one of my favorite ways to teach about the science of sound. Actually, this magic little box is more than just a toy box. It is part of a larger, more comprehensive project that can end with instrument design and construction. To begin, I collected many different items from around my classroom and home. 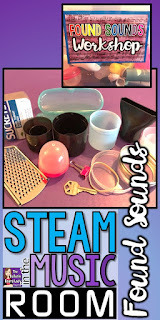 I made sure these items would be safe to use in the classroom, made an interesting sound and were not valuable items. In considering safety I did not include forks, rubber bands or anything with a sharp, pointy edge. I didn't include anything valuable because kids break stuff. 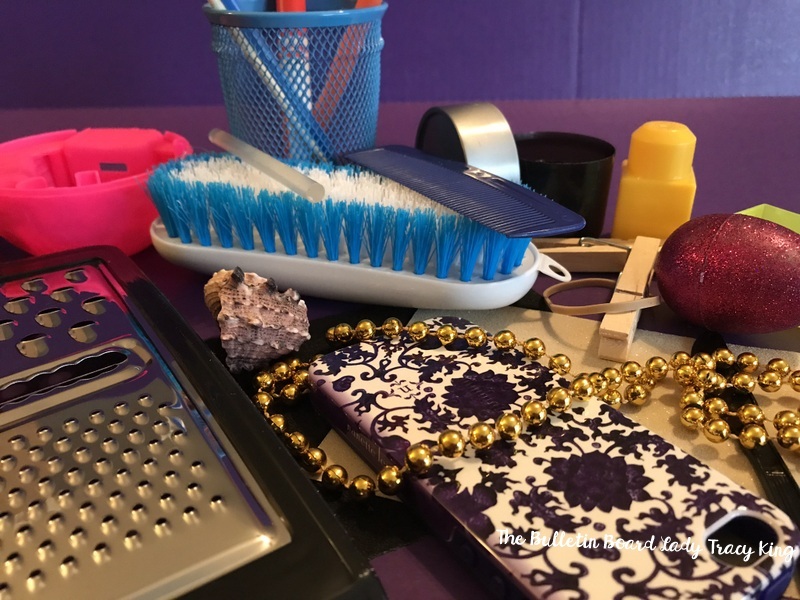 I also purchased a few items from the dollar store because I wanted them to be new. 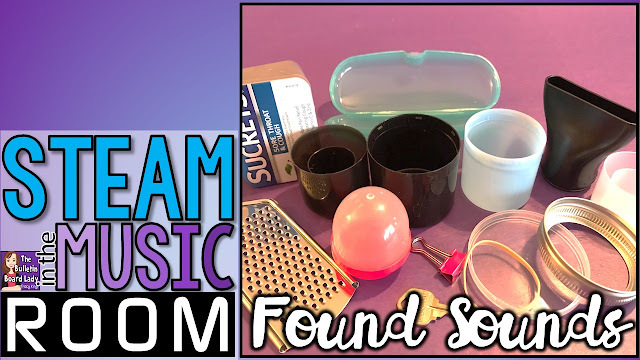 For example, the scrub brush is a great addition to the Found Sounds Box, but a dirty one would not be fun! 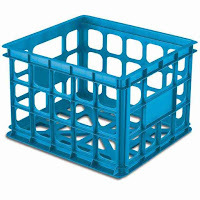 I also purchased a couple of cheese graters (that were not very sharp) and some gum in a plastic wrapped container. Every thing else was found at home or school. 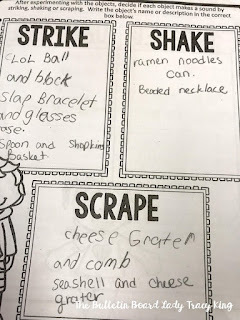 I wanted to make sure that I included 4 types of items: shakers, strikers, scrapers and mallets. 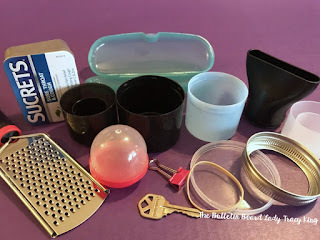 Shakers: gum or candy containers in their plastic wrapping, cups of ramen noodles, Tic Tacs, a box of paper clips (that I taped closed) and keys on a key chain. Scrapers: cheese graters, wire cups, beaded necklace, metal jar ring, scrub brush and combs. Strikers: small lids from deodorant, spray paint, perfume bottles, etc..., tins and small boxes, miscellaneous containers, toys or pieces from toys and cups. 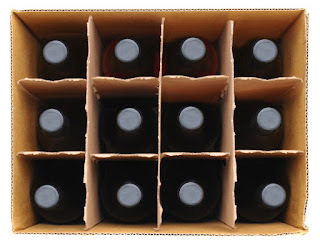 Over the years, I've used several different kinds of boxes to store my found sound objects. Right now I'm using a small file folder box. 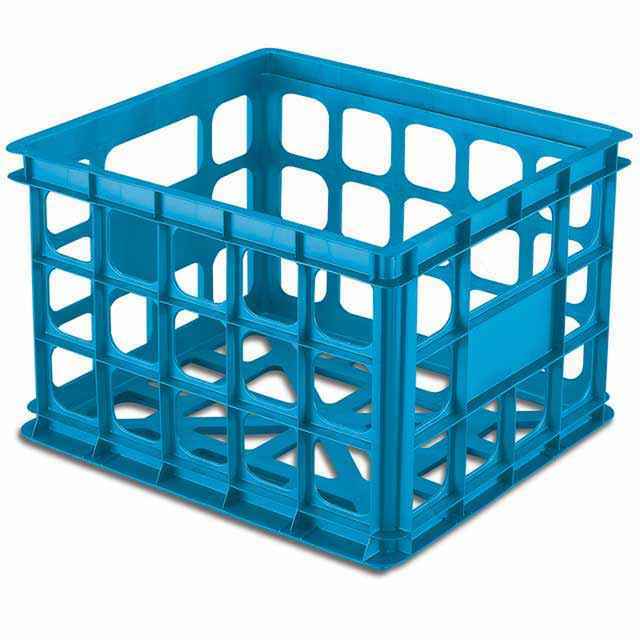 Plastic shoe boxes are a great size to start with. I most often use the Found Sounds Workshop as a workstation. Students can complete one activity in the time they have at this center. 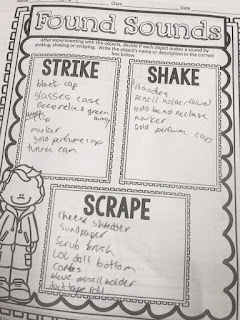 I have worksheets that ask students to categorize objects by how they make the best sound: strike, shake or scrape. Other worksheets as them to distinguish between pitch and unpitched, high and low and what material they are made of. Students love exploring the different objects in the box and often come up with some creative ideas for how to use them. This activity works well with a variety of grade levels. With Kindergarten and 1st grade they often drew pictures of the objects than coming up with a name or description for them. My 4th and 5th graders were able to name (sometimes with great detail) the objects in the box. 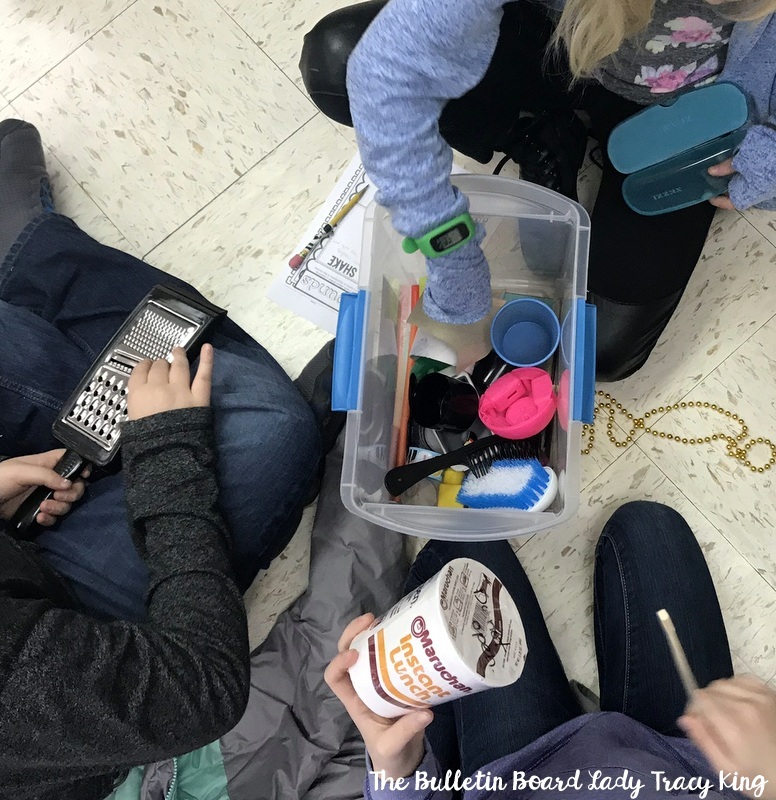 After students have had an experience with classifying the objects in the box, the next activity is to create a composition and perform with their found sounds. I've experimented with this activity and discovered that it saves a great deal of time if I give them a framework that their composition can be created within. This includes a 16 block grid with room for writing/drawing their "instrument" choice. With some classes I chose to complete most of the grid for them so that they only have a few choices to make. This really is just a time saver, as students are able to complete the entire composition themselves. This ensures that everyone is ready for performance during the same class period. The composition worksheets and all of the ones I've mentioned above are available for download HERE. After students have completed the composition and have experience with what works best, it is time to create their own instrument by combining found objects. I've done this many different ways. If your school has a dedicated maker space, you may already have all of the raw materials that you will need. If not you'll want to send out requests to co-workers, parents and possibly some local factories for items your students can use for instrument construction. 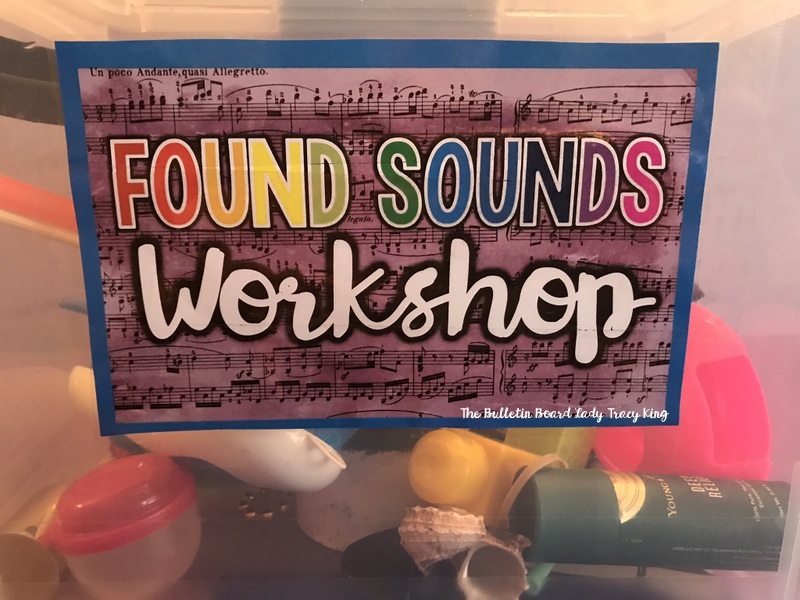 I have a large list of items that you can reproduce and send home with your students in the Found Sounds Workshop download in my TpT store. 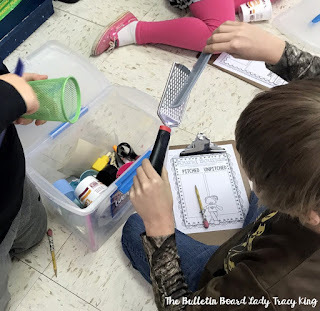 One way to approach this project is to have students examine the materials that they have available to them and then sketch a design for an instrument. (I have them use a planning sheet during this part of the project.) Another way is to have them dream up a great idea, sketch it and make a list of needed supplies. Next, students find their supplies from your found sounds collections, recycle bins or from their homes. 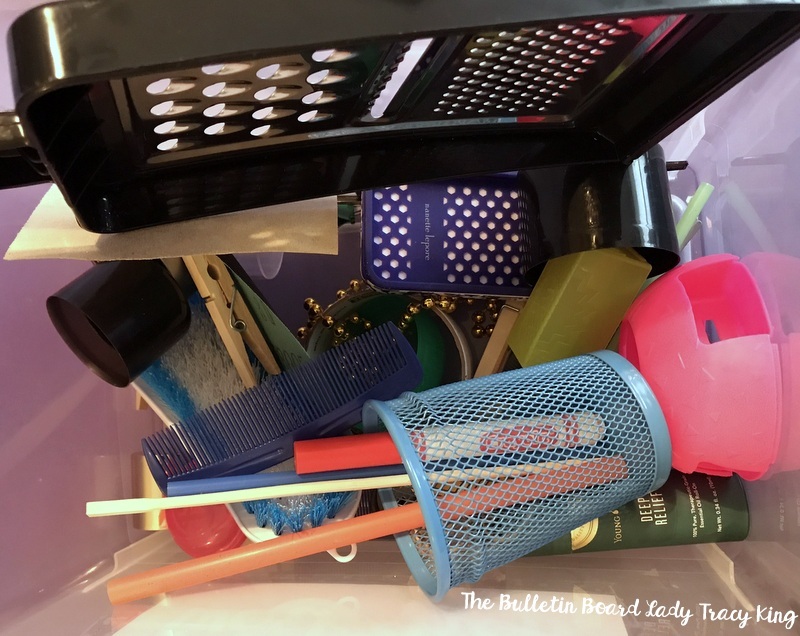 This way allows students the most creative experience but depending on students to bring in the needed supplies can cause problems. 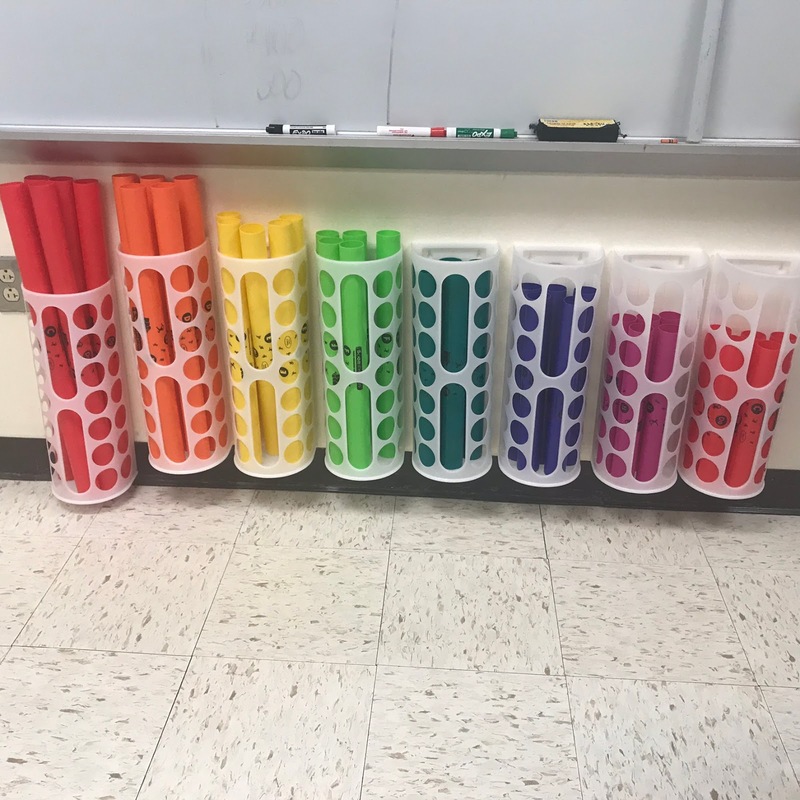 In a small school district that I worked in, I had students complete their instruments at home and bring them in to class. This was mostly successful, but it was quite obvious which students did the work and which students' parents did the work. If you are interested in using the worksheets that I use, they are available for download HERE. If you like these ideas, PIN this post for later! Scientific and technological innovations continue to become increasingly important in our every day lives. To succeed in our new information-based and highly technological society, students need to develop their capabilities so much more than what was considered acceptable in the past. As schools around the world focus on STEM initiatives, forward thinkers are looking to the arts to strengthen this focus to STEAM. As music educators, how to we incorporate the idea of career readiness and technological proficiency in our lessons? How do we provide problem solving, project based learning activities when we see our students one time a week for 50 minutes? I must admit that I don't know all of the answers. 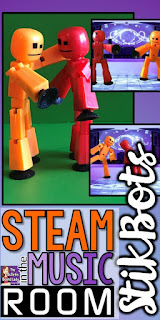 I'm about to embark on a STEAM journey and am inviting you to join me. I'll be sharing some of my ideas for incorporating science, technology, engineering and math into my classroom. 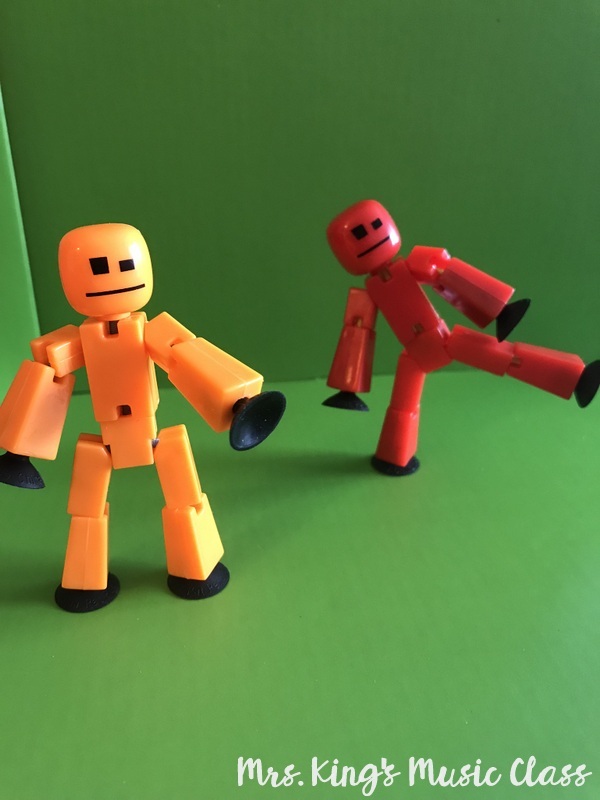 I picked up my first set of StikBots at Target months and months ago. I had a few ideas about what I wanted to do with them and then life happened and they just sat on a shelf looking at me with their half-smiles, waiting for me to pick them up. When I did, I was delighted with how easy they were to use! 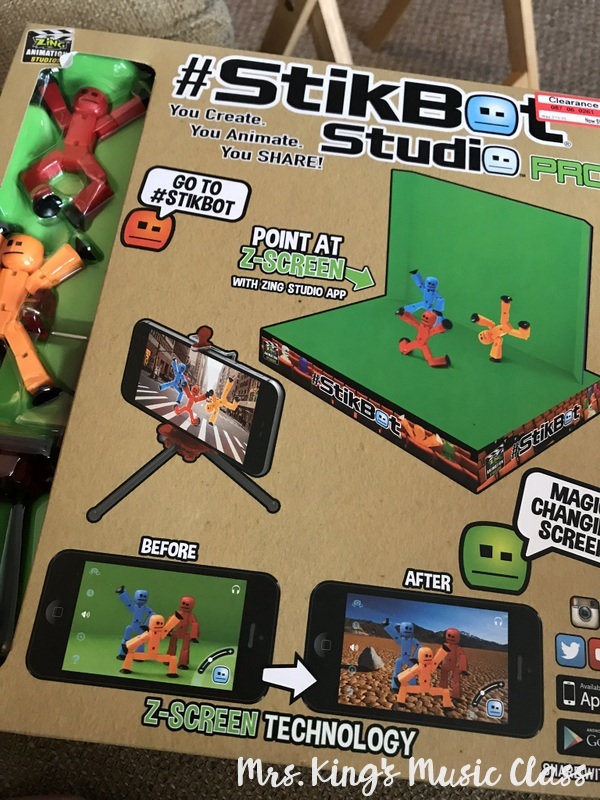 The studio pack comes with two StikBots, a simple tripod and a green screen stage. I sat it up in just a few minutes and downloaded the app for my phone. 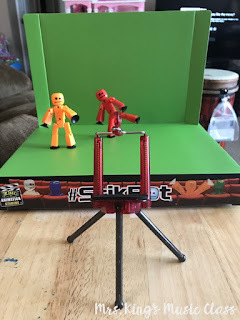 I was creating my first stop animation video before I knew it! If you would rather not just jump in, you might like to watch this Stikbot tutorial I found on YouTube. 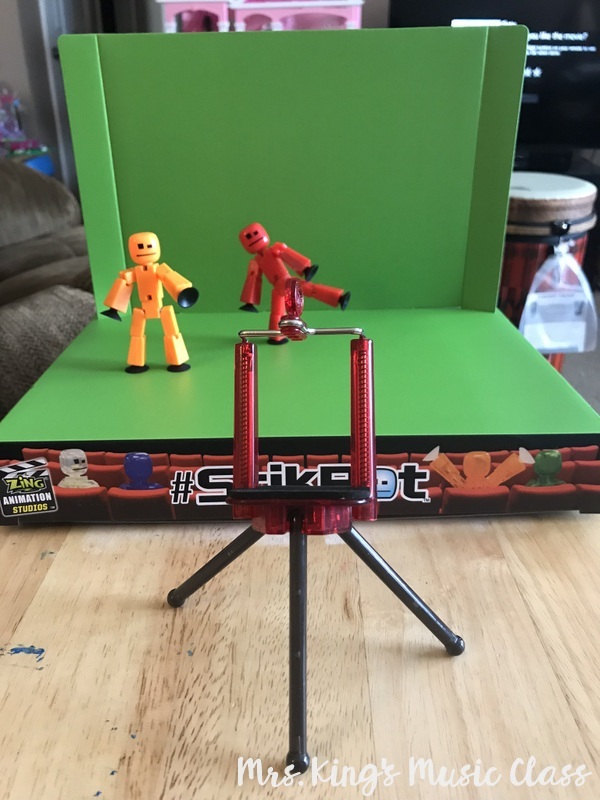 Although the StikBot figures are an obvious choice for creating your videos, you can actually use anything! Barbies, figurines, LOL dolls, stuffed animals, action figures are great. Be creative! Try salt shakers, rocks, Play Dough blobs, shoes or whatever you want! 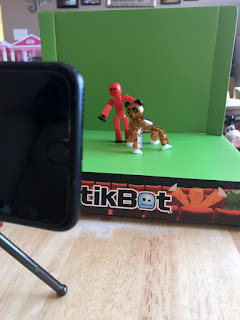 For class I chose to use the Stikbots because it eliminated one of the decisions that that students would need to make and it created the same experience for each group. Due to limited time, I had to plan for students to be able to find success in creating a video with as few choices as they could. 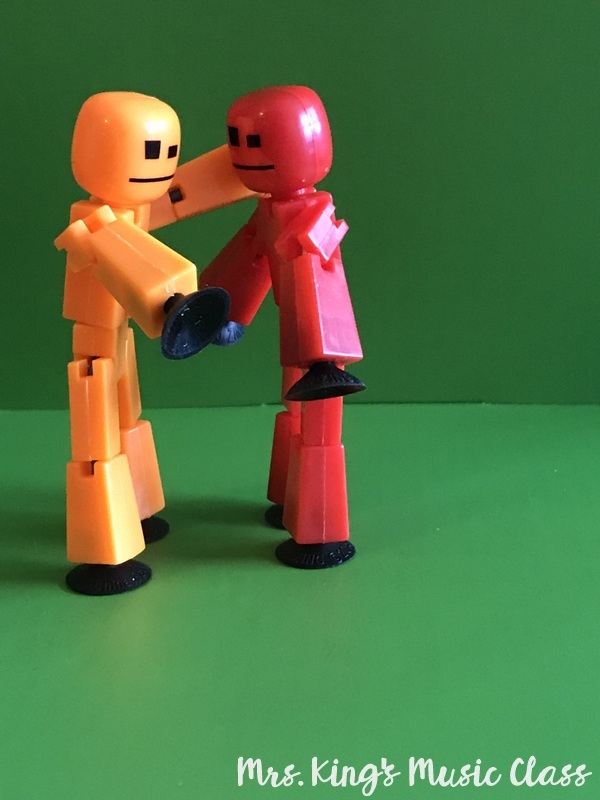 With more time, allowing them to choose different characters or even creating their own would be an excellent addition to these lessons. I had enough sets of the studio packs to divide my students into several groups. I also had enough old phones with wifi that I could bring in on the days we worked with StikBots. I've sent out a few requests to friends and family members for old phone donations. I hope to get enough so that I don't have to bring mine in each time I want to use them. If your students are allowed to use their own phones at school you may have a student volunteer to use their phone and just message or email their video to you when they are finished. With minimal instruction, here's a video my 6 year old daughter made in just a few minutes. 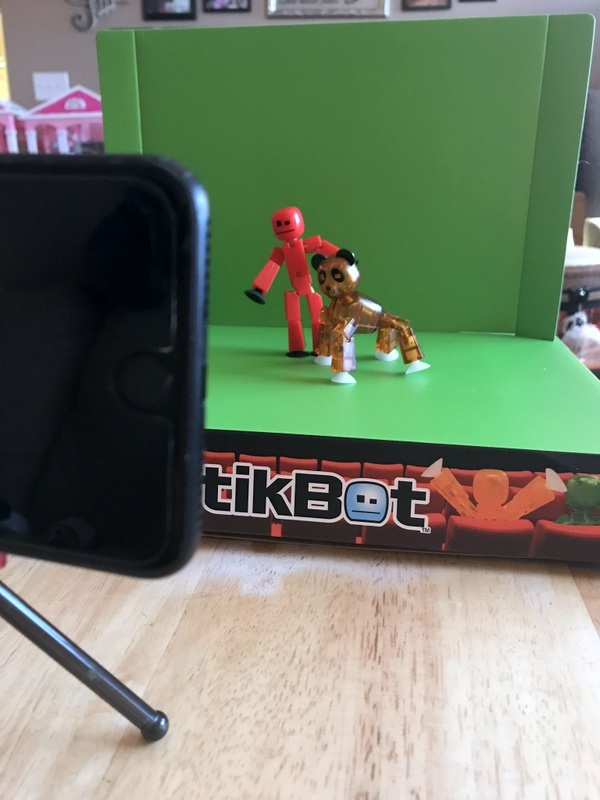 When using Stikbots with students, their first experience with them is learning how to use them. They can create any kind of video with them. We take enough shots for a 9-15 second video. This doesn't sound like much, but it takes quite a few photos of slightly different moves to create a video of this length. I want students to understand how much they need to move the Stikbots and I want them to experiment and make mistakes. Sometimes the best way to gain understanding is to make many mistakes and keep going! After students have taken all of the shots they need, they can view their video and discuss things that need improving and things that worked well. The next project that they do, they can include a background and music. There are several different backgrounds included and there are also a few music tracks that work well with a variety of scenes. This video uses one of the Stikbot animal characters and a picture of the elementary school outside my front window. 1. Demonstration of an original dance they have created. 2. Demonstration of movement concepts like time, space, flow, shape, levels, pathways and more. 3. Demonstration of a folk dance or play party game. 4. Choreography for a song they are working on in class. 8. Tips on performance posture. 9. Music Theory Hour -discuss an element of music. 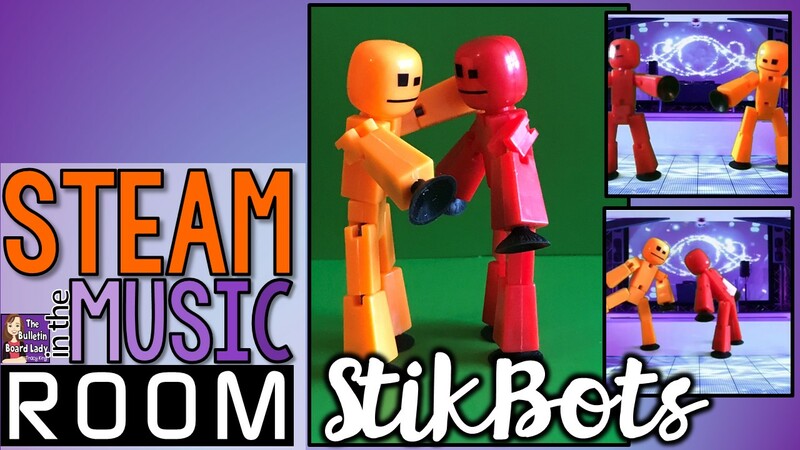 There are SO many possibilities for using Stikbots in music class. If you've tried it, I would love to learn how you are using them! 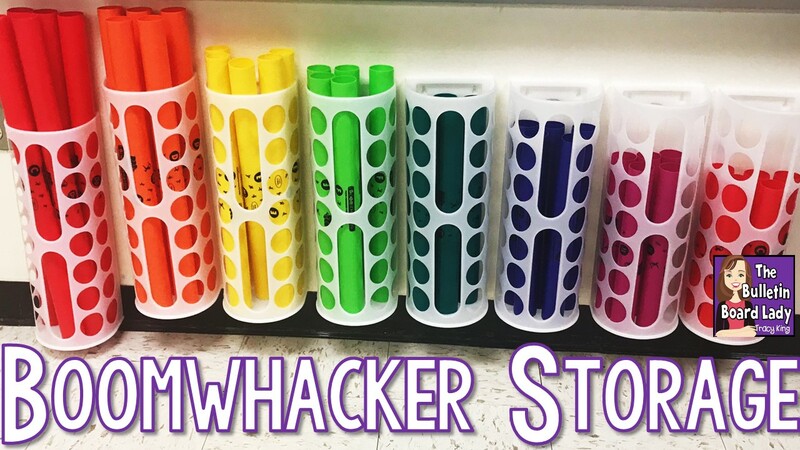 My students love Boomwhackers and so do I! Like most of you when I first got mine (many years ago!) I put them all in a bucket and then in a big rope handled tub when my collection grew. This caused a bit of confusion and chaos when I had students get a specific tube out of the tub. 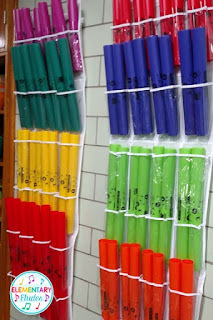 In this post I'll share some of my favorite ways to store Boomwhackers. 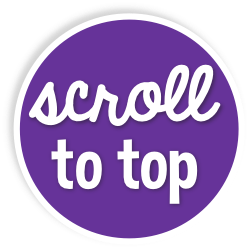 Links in this post are not affiliate links. 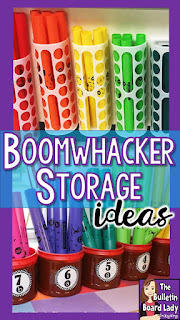 My first attempt at organized Boomwhacker storage was to recycle plastic coffee cans. I spray painted them, added labels and sorted the Boomwhackers by pitch. This worked great on my instrument shelf near the window. I loved the way they looked. I think if I try this again that I might try painting the cans to match the Boomwhacker colors. That would be a little bit more of an investment, but I bet it would look great! Read this blog post about how I made this storage and download some free labels for your classroom. In my current classroom I don't have much space for horizontal storage. What I do have a lot of is wall space! I purchased these plastic bag storage containers from IKEA and attached them to the wall under my white board. They fit well and look great! I may add labels to them at a later date, but right now I like the way they look without labels. They are easy for the students to access and are in a great place for a Boomwhacker workstation. 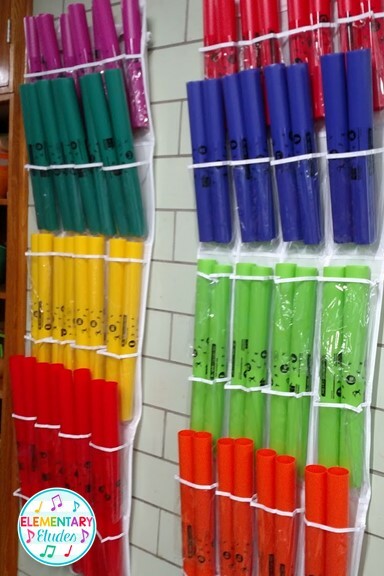 Christine Skog at Elementary Etudes used over the door shoe organizers to create an inexpensive and beautiful display. Check out her tutorial HERE to see how to make your own. 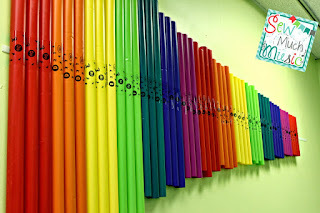 Jena Hudson at Sew Much Music used some available wall space to create a beautiful and functional way to store Boomwhackers. Her secret? Velcro! 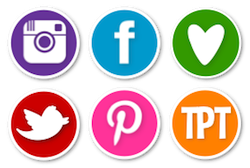 Check out this post to learn more. 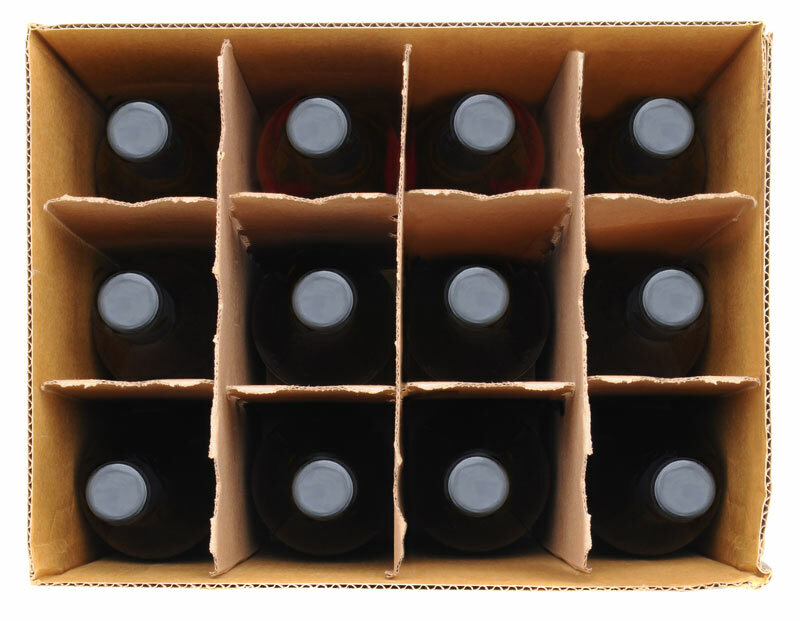 I've always thought that these crates or an empty wine box would also make great storage options for Boomwhackers. I haven't tried them yet, but I think they have potential!